We tried to get there as quickly as we could as we were coming from Arlington, and hilariously we left before everyone else in the party and still showed up after them. The host gave my daughter a cute sticker that lit up when you pressed it, then guided us to our semi-private room. Amazing Jake's supplied the four colored balloons, cups, plates, and napkins while we brought our own Spongebob decorations. Parents had to pay $7.95 each for a buffet even if they didn't plan to eat which we did think was a bit high. We could understand if they wanted to eat or snack but a few didn't eat at all and still had to pay to get in. But, some of them said they wouldn't eat, and did any way, haha. It was really great to see everything already set up and the room was all ready for us. As you can see there was plenty of room in the party room for the kids to play. I had brought bubbles as party favors so the kids were having a ball with them. The food that came fresh to the room was fantastic we had pizza and drinks. I also loved the buffet food, the salad bar was fresh and great. Full of greens, and there was plenty to choose from. Our hostess was fantastic in keeping everything up and making sure we stayed as close to the time as we could. Unlike Chuck E Cheese which would deliver food but have us doing everything from giving food to kids to prepping the cake, Amazing Jake's did it all! She was surprised I had brought a lighter, candles, everything but tape for the decorations. The party went smooth and easy and I didn't feel like we were really rushed until we realized time had just flown by. You can hear our hostess in the background get everyone singing, and it was really great how everyone was happy to join in and relax. After getting 90 minutes in the party room, the kids were taken to the prize wheel where Olivia spun and won 1000 tickets! It was a lot of fun, and I joked "Big money no whammies!" which only half the people got (shows my age now). We then all got game cards and off everyone ran! First negative: Escalator going up does not work. So you either have to climb the escalator to get to the games and rides, or you have to take an elevator. I don't know how long the escalator hasn't been working but it was pretty dirty so I'm going to say a while. Even the employees when I mentioned I'd climbed it four times so far said they took the elevator because it was exhausting walking up that thing. They had so many different things you could do from laser tag, miniature golf, a carosel ride, bumper cars, go karts, and a train (second negative: train didn't work). My daughter was disappointed as she loves riding trains and she kept trying to get us to go there but couldn't. She loved the rides she could get on though. I took her on the Go Karts though that was a LONG WAIT just to get on. They only allow 4 karts at a time, and kids were letting friends jump in front of me just to get everyone at once. I had one girl who turned and looked at me and went "You're just going to have to wait. We want to ride, and I want number 9 as it's the fastest." By the time I got to the front, the kids were telling the ride operator they wanted to wait until they could ride particular numbers, and I was ready to scream. But it wasn't the ride operator's fault it was the lack of parents at the time. Olivia was HOOKED on skee-ball, and throwing games. She also loved running around with her friends and seeing all the stuff she could do. I really cannot find a lot to "critique" on this place except that things need to be fixed. The employees were extremely kind and accomodating except at the very end. When it came time to leave I went to ask for our cupcakes, and a female employee kept trying to get a male employee's attention. He kept chatting with another male employee and when she got him to turn around he yelled "WHAT?!" She told him to get the cupcakes, and he goes "No I'm not doing that! I can't do that!" and started arguing in front of us. Then, I guess he realized it looked really bad because suddenly he smiled and took off to go get them. No clue, personality issues? I don't know, but it was fine. 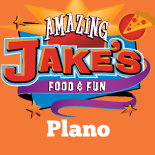 All in all, Amazing Jakes in Plano is a FANTASTIC place to go for your kid's birthday party. You get so much more than if you go to Chuck E Cheese including better food, better games, more stuff to do and it's awesome. I am hoping to do it again next year if my daughter really wants to. A huge thanks to Amazing Jake's for the best birthday my daughter has had in recent years, and keep up the great work! Amazing Jakes Plano Party manager Michelle N. and party hostess Marisol were the absolute best!!! We didn't want for anything and the staff took care of everything!!! We will definitely have another party here! Thank you so much!